Poke Balls are not one size fits all. When I was a kid, I always wondered what a Poke Ball would feel like. I have weirdly small hands (I also fit into child size clothes—score! ), and I've always wondered if in the Pokemon universe if Poke Balls would come in different sizes. After all, the show follows a bunch of kids running around without adult supervision, meeting (usually evil) grown-ups along the journey too. It's been one of the most pointless mysteries I've followed since I was in elementary school: Do Poke Balls come in multiple sizes? Judging from the upcoming Poke Ball Plus, it unfortunately does not come in multiple sizes. 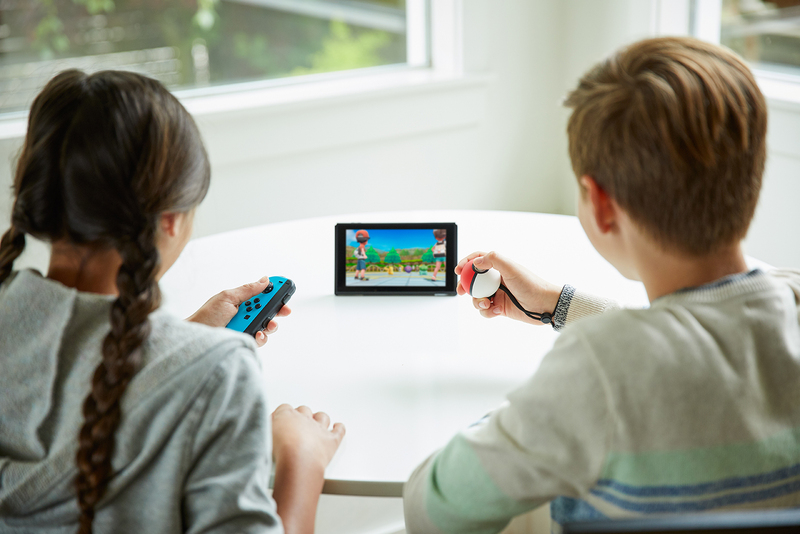 Later this year, Nintendo will unleash the Poke Ball Plus, its newest creation, a controller to use with its game Pokemon Let's Go Pikachu and Eevee. It will also be compatible with Pokemon Go, that app that everyone's so crazy about. And yet, it's the perfect size for my baby hands. A couple weeks ago at PAX West, I got some hands-on time with the nifty controller and the game it'll work primarily with. If there's anything that is making me question the future potential for what I dreamed of in Pokemon as a kid, it's that controller. The Poke Ball Plus is surprisingly small, but it makes sense since it's geared towards kids and casual players. At the top you'll find a tiny analog stick, along with a button. It's a motion-controlled controller, meaning you fake-toss it at the screen. (I imagine in the months that follow its release, we're going to see an awful lot of Child Broke 4K Television Screen Trying to Catch a Caterpie headlines.) Its design is very intuitive. You control the character with the analog stick, use the button to click around the menu when you're in a battle or trying to catch a Pokemon. You swing the Poke Ball to catch something and can aim your toss however you want, just as with swiping to throw Poke Balls in Pokemon Go. Its functionality is basically just three inputs, and that's all it really needs. Pokemon Let's Go, likewise, is also devilishly simple. When you bump into Pokemon in tall grass, you can feed them berries and try to catch them, similar to how you do in Pokemon Go. Otherwise, combat only come in the form of trainer battles—from those hawk-eyed, bucket-hat wearing NPCs lurking in the shadows, waiting to make eye contact with you to initiate a challenge. It's obviously different from the typical Pokemon RPGs we're used to, and a Nintendo representative assures that, as we already know, a traditional RPG due for release in 2019 is in the works from Game Freak too. The Poke Ball Plus is nowhere near that size, nor that usefulness—yet. 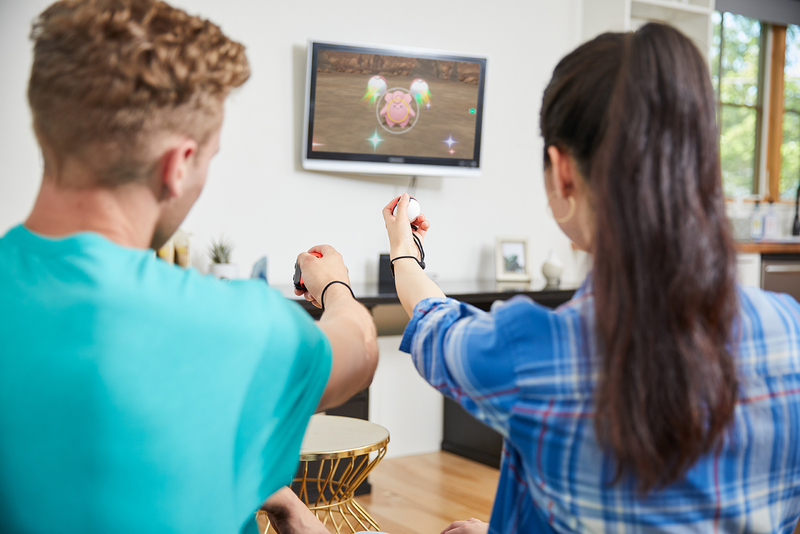 Promotional photos show the Poke Ball Plus being played with alongside another person, making for a solid co-op experience between friends, family members, kids and adults. With its functionality working from Pokemon Let's Go to Pokemon Go, I ask a Nintendo rep if it's likely that we'll see other games in the future take advantage of the hardware too. They say that as of now, it's just this, while not denying the potential for the future. There are still folks in the world upset about the Pokemon Yellow-inspired casual game on the horizon; there are people not happy with the Poke Ball Plus too. But what I played was endearing enough, one of the sorts of experiences that I immediately wished my little cousins had a Switch to experience. It won't replace the Pokemon games I admittedly never beat as a kid, but Pokemon Let's Go introduces a new experience that was started by Pokemon Go: an accessible Pokemon to help get people interested in the traditional lineage of Pokemon. With its RPG framing, it's shaping up to be the perfect stepping stone. The Poke Ball Plus, too, helps enable that Pokemon catching fantasy. Who knows if it'll explode the same way that Pokemon Go did that first month, where I saw Golden Gate Park full of people happily catching Pidgeys. I still see people walking around my neighborhood with the Pokemon Go Plus button clipped onto their shirts or wrapped around their wrists, and I imagine it'll be a funny sight if the Poke Ball Plus catches on—I mean, come on, seeing a bunch of people throwing-but-not-really-throwing a hunk of plastic at the air from a street corner is a hilarious scenario to think about. At the very least, it'll make for a handy cosplay accessory. I know for sure I'll be getting it. Even if one size doesn't fit all for Poke Balls and I predict a lot of veteran players will be disappointed, the Poke Ball Plus is a size that fits me. Disclosure: USgamer is part of Gamer Network, which is owned by ReedPOP, the organizers of the PAX events including PAX West. For Pokemon Let's Go and the Poke Ball Plus' release date and more, check out our Pokemon Let's Go Pikachu and Eevee everything we know guide. Tagged with Analyses,	Game Freak,	Nintendo,	pax west 2018,	Poke Ball Plus,	Pokemon.